Although this ride clashed with England's first World Cup match of the 2006 competition (v Paraguay), glorious sunny weather and perfect riding conditions helped ensure that no less than 9 riders set off from Bognor library. Six came as a result of the entry in the Rides and Walks publication, from as far afield as Rudgwick, Worthing, and Boxgrove. 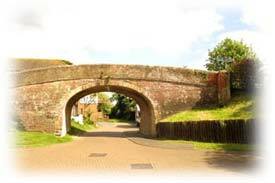 We set off via the back streets of Bognor, over the railway and through the industrial estate, to reach the quieter lanes of Shripney. A short bridleway cut the corner off to reach the A29, then Hook Lane, Aldingbourne Church, and Crockerhill were all passed to reach our destination. After a suitable refreshment break the return route took us via Level Mare Lane, Northfields Lane (which was as potholed as ever, but quite rideable), Eastergate Lane and Barnham station, where Alan and Liz departed for shopping and our Worthing rider left for the train home. 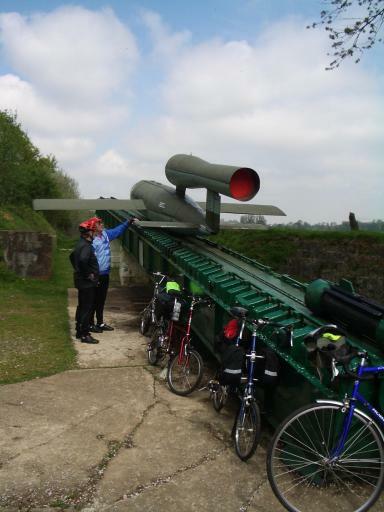 The rest of us continued to Yapton via a short stretch of the old Portsmouth-Arundel canal towpath to Tack Lee bridge, where our friends from Rudgwick took some photos. From there it was an easy run to Bilsham, Middleton, Felpham, and then via the seafront to central Bognor Regis and the library. Mileage from the start point to finish was 19.5. Despite a beautiful evening with no wind, resulting in excellent cycling conditions, no-one (save the leader) turned up at the Felpham start point. The ride was therefore cancelled. After a cold and wet May our first June ride was late Spring at its very best - clear blue skies and warm sunshine all day. The countryside was all very lush and green. We met very little traffic along the maze of narrow lanes. Avryl (leader),Alan, Liz, Jan, Christine, Harvey, Bruce, Adrian, Joined by Phil,(leader) Mary, Chris, Gill and Clive, who started the ride from Chichester and joined us at the station car park. 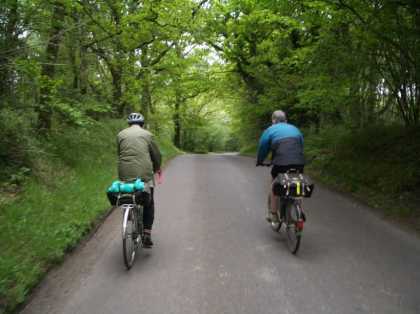 It was a circular route from Petersfield, going west towards Ramsdean, turning south to go up Hyden Hill where we had a welcome stop at the Sustainability Centre. We had lovely views going along the ridge at Teg Down and then south west to Westend Down. Most of the ride was then downhill heading due south until we reached The Horse and Groom at Ripley where we stopped for lunch. In the afternoon we headed east going through Denmead, to Denmead Mill, Hinton Daubney,Hinton Manor to Clanfield We then had a long slow uphill climb to Butser Hill where we walked to the top to enjoy the views. Our reward for the climb was a whizz down Harvester Lane to the tea stop at a barn where some of us sampled their delicious cream teas. We clocked up 33mls. and all felt a little more weary than the mileage depicts! Another fine summers evening as 3 of us (John, Karen, and myself)set off from The Fox at Felpham, continuing the summer evening rides programme. We headed off into the surprisingly quiet centre of Bognor Regis, then west along the promenade to Aldwick and Craigweil where we took Stoney Stile Lane to Rose Green, then Nyetimber, Summer Lane and across rough tracks to the Pagham Rife Bridge and Bowley Farm. The ground was hard packed and the riding quite smooth, although our progress was hampered by the presence of 1 billion (approximately) midgies; the air was literally thick with them. Having survived the worst of the insects, we continued across farm tracks through Fisher until we arrived back on tarmac at Hunston Church. From there it was a short run to the pub, having ridden for exactly one hour. We found the group which started from Chichester had already made themselves comfortable in the garden. The return route stuck solely to the tarmac via North Mundham and Runcton. On arrival back at Felpham I had covered just over 16 miles. A fine sunny day with NO RAIN and warm. Perhaps summer is going to come after all. Just three of us,Harvey Steve and I, set off from Walberton and after a few minutes a group of cyclists headed towards us - Arun and Adur, going in the opposite direction. We made our way to the lunch stop via The Spur, Madehurst Amberley and Wiggonholt where we were joined by Tom and Colin for elevenses. At The Oddfellows Arms Mike Alan Liz and Eric appeared and a group of riders from the Horsham Section were well installed inside. On our return just the three starters kept together, the others making their various ways back. We came on a very pleasant and quiet route through Greatham West Burton Bignor and Bury to Whiteways and back to Walberton.